Another start-up from Silicon Valley. That’s where the world’s biggest companies were born. Everyone knows Google, Oracle, eBay, Yahoo !, Adobe, Facebook, LinkedIn and others. This time it’s a new type of advertising. It seems that in this field everything has been found. But VID is offered to sew video ads into text on the Internet. This will be displayed with special icons that can be pressed or not pressed, at the request of the reader. Now I will not regret watching ads about interesting topics. Because after all, advertisers will pay viewers directly for that. Now, we start ICO VIDY. What is the VIDY layer? Vidy has created the first page invisible embed layer for videos, run on the Ethereum blockchain. By just waiting, users can now reveal hyper-relevant small videos hidden behind the text of any page on the web, unlocking new dimensions to the internet. 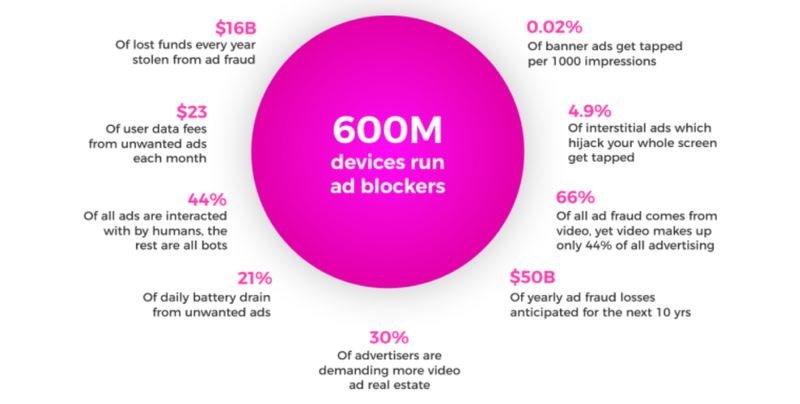 Around 600 million people in the world use various ad blockers for smart phones and PCs to avoid Intrusive advertising. Advertising in such a way has become a blind spot for users they like not to watch it at all. At the same time, they revoke the opportunity to see new technologies and products in subjects that interest them. Advertisers spend more money every day to reach consumers’ hearts. Vidy doesn’t immediately show ads. This plugin only highlights text that is relevant to the ad. When you move the mouse to this text area, a small window will appear where you can intuitively see where this content goes. This can be part of a video, picture or text call. Thus, consumers are not disturbed by foreign elements, but consume information in the flow. And if the advertising content interests him and solves the problem, he goes there ready. 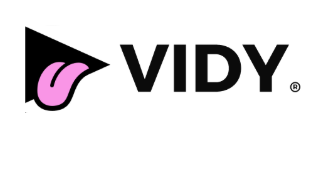 Vidy pays attention to how long the user has held the ad’s attention, and paid a token for that VidyCoins for that. So, for the time spent watching advertisements, employers pay. Mechanics like that can save users time. Because he has the ability to consume more information about new products and services. That is, if he reads the text, he is interested. When he read, he learned from the text about companies that are currently involved in solving consumer content problems. If he draws the attention of several proposals, then it will be his. As such, consumers are at the forefront of the wave of innovation in subjects that are interesting, gentle and unobtrusive. Still and produce below. For advertisers, Vidy is an opportunity to show your ads on millions of pages on the Internet. This opens up opportunities to find consumers with very low frequency requests, on target, and save on advertising budgets. The resource, which is text and who sees the ad also gets a gift token. This technology cannot be done without Blockchain. First, to make micro transactions between users, advertisers, and resource owners with text. Second, all advertisements, views and advertisements must be clearly considered, so as not to make mistakes with payments. Third, not to allow fraudulent views automatically. Finally, the ICO industry headed to Silicon Valley. In the last few decades, this place is considered as the center of world innovation, because it has the largest number of per capita discoveries. On the one hand, the VID project is an ordinary startup, but it’s good to show the potential of what will happen if you connect Silicon Valley and the ICO. The project has completed a closed presale. Pre-ICO will begin in 30 days. Like many silicon valley startups, Vidy’s history began in the Harvard Dorm room, where Patrick Colangelo got the idea. 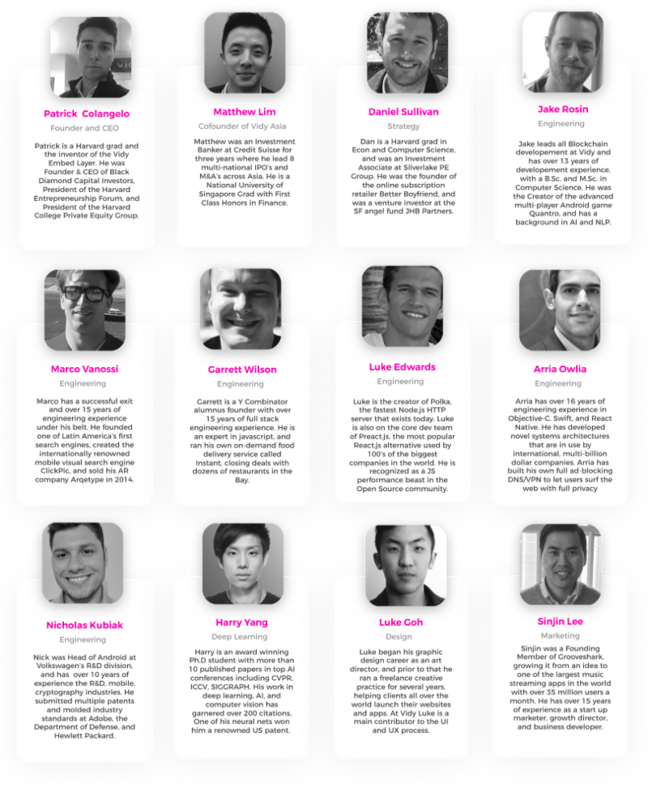 A few years later, Vidy was a team of world-class engineers and entrepreneurs. Each of them has more than one success in the technology business and earns more than one million dollars.